The police department in Fremont, Calif., the same Fremont where the Tesla factory is, just bought a used Tesla Model S 85 to replace a retiring Dodge Charger. 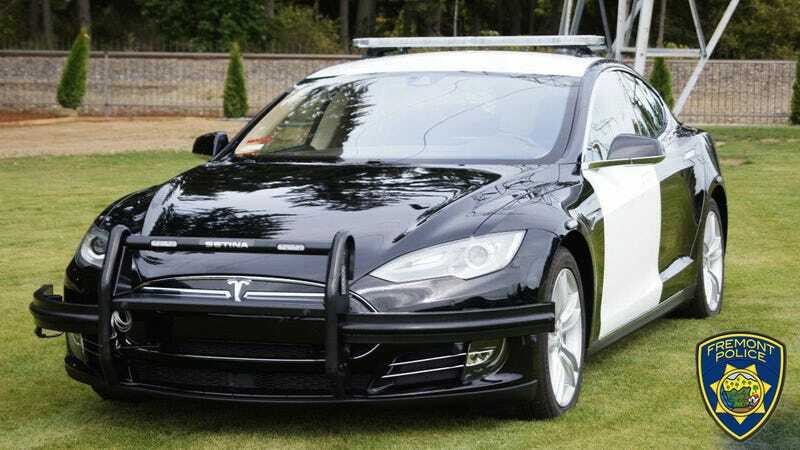 The car has been fitted with all the standard cop-spec accessories and will soon go on duty as part of a pilot program to see if a Tesla is up to the task of police work. You might remember that the LAPD conducted its own “pilot program” for running Model S cop cars a few years ago, which sort of quietly petered out. More recently, local news figured out that Los Angeles’ electric cars weren’t getting a lot of mileage. So I guess I wouldn’t hold your breath for a tidal wave of electric vehicles replacing regular police cars in the near future, but hopefully Fremont gets something new out of its test. You can look at the PowerPoint deck somebody made to sell this idea, but basically it sounds like Fremont Police thinks a Tesla cop car could be built for about the same price as a regular Ford SUV, but may be cheaper and more environmentally friendly to operate over its lifespan. A press release from Fremont Police lays out how much money we’re talking about here: The 2014 Tesla Model S 85 was purchased in January 2018 for $61,478.50 all-up. Over the last year, Fremont PD has added things like a light bar, push bumper and ballistic barriers which it states rang up at $4,447 to date. As to why the department purchased a used Tesla instead of a new one, I would guess cost would be the main factor there. We reached out to Tesla to see if the company had any official involvement in this pilot program, and we’ll update this post if we hear back. The police department also explained that one of those Explorers usually lasts five years, burns $32,000 worth of gas and needs $15,000 worth of maintenance over its lifespan on duty. How expensive the Tesla will be to operate, and how long its service life is, is exactly what Fremont PD is hoping to figure out. To keep its new used Tesla charged, the “City’s Police Complex has 872 kW of solar carport structures installed onsite and three charging stations,” meaning that the car will be powered by renewable energy. Police car parts sound cooler when Elwood Blues rattles them off. But it will be interesting to see how this used Tesla holds up against harsh use.